JRLA brings 3D scanned models of vehicles and sites together in the virtual environment to reconstruct and visualize accidents with an unprecedented level of realism. JRLA helped pioneer the use of laser scanning and virtual reality for state-of-the-art accident reconstruction and 3D visualization. This allows us to analyze accidents in a level of detail and accuracy not possible with more conventional 2D methods. 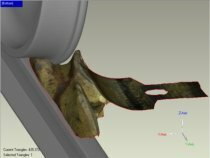 We bring 3D scanned models of vehicles and objects to a scanned collision site for measurement and evidence matching in the virtual environment using the latest software. We work with our own scan data and scans from outside sources as well and use true 3D visualization methods including 3D stereoscopy.